I’m not a musical purist. As a composer for video games and films, I’m totally for electronic instruments that can mimic acoustic instruments. I work on tight budgets and I don’t have, for example, a grand piano sitting in my office. Even if I did, pianos are notoriously difficult to mic — that takes a fair amount of skill and a room with great acoustics, which I also don’t have. Synthesized pianos — meaning sample-based software synthesizers that run on your computer — are a “good enough” alternative, yet less than perfect. Every time you hit a note on the keyboard, the synthesizer fetches a sample of an actual recorded piano (that resides on the hard drive of your computer) and plays it back for you. The downside to this sort of technology is: a) Sampled pianos never sound absolutely real because they can’t mimic the vast complexity of a real piano, and b) All those large samples take a while to load into your computer’s memory as well as taking up a significant amount of space on your hard drive. 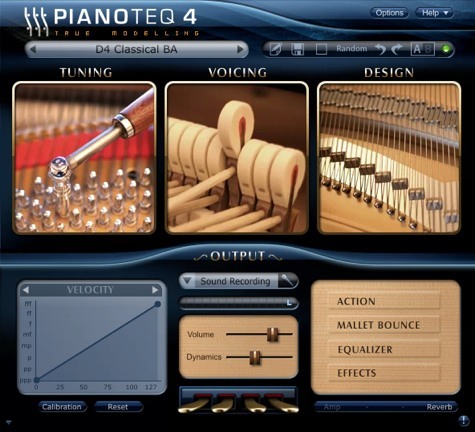 Enter Pianoteq (stand alone or plug-in Mac or Windows). It uses a type of synthesis called physical modeling, which recreates the original instrument mathematically. In the case of the piano, this involves modeling the hammers, the strings, the soundboard, and even the pedals. And it’s hands down the most true-sounding synthesized piano I’ve ever played. Pianoteq captures the sounds of every key at every velocity. It accurately captures harmonics when I press the sustain pedal down. Or that weird (wonderful) buzzing in lowest octave. I’m not a maestro but, in a taste test, I can’t tell tell the difference between a recording of Pianoteq and a recording of a real piano. But it gets better still. Using sliders, Pianoteq allows me to tweak and adjust practically every aspect of the physical model. No piano or any other synthesized piano that I know of can do this. 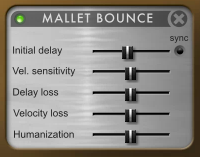 I can adjust how much hammer noise I want to hear, or what point on the strings the hammers hits. I can change the length of the soundboard or the length of the strings, mute the strings, mic the piano in a virtual space, and on and on. All of this dramatically changes the sound. I can start with a piano that sounds like a Bosendorfer and, in a matter of seconds, I can end up with something with something that sounds almost percussive, but still very acoustic. Or I can tweak the sound toward something more bell-like. Because Pianoteq is algorithmically based, it’s small… a mere 20 megabytes. Its sampled cousins weigh in at hefty 2 – 4 gigabytes and require around 4 gigabytes of internal memory. The upshot of this: Pianoteq loads lightning fast, which is a nice plus when I’m in the middle of writing music (or just fiddling around). Before I encountered Pianoteq, I had always partially hid sampled pianos under a veil of other instruments. Using Pianoteq I now tend to feature pianos or even solo pianos, because they sound real. And rich. From my perspective, now I have any number of virtual pianos sitting around in my office, from a wide variety of grands, to uprights, to antique grands, to old detuned pianos, etc…. But a YouTube video paints a thousand words, or something like that. In the short video below using one of my compositions for the film The Immortal Augustus Gladstone, I’ll quickly demonstrate just a few of Pianoteq’s adjustments. The Condition slider allows you to modify the state of the instrument, from freshly tuned to completely worn out. After a right click on the slider, changing the Random seed parameter will allow you to enjoy thousands of broken instrument variations.